He's going, going, he's not gone though. Approaching the last, Ask Heather looked a dead cert. After jumping the last, the horse looked beaten and its jockey Mikey Sweeney looked a goner. 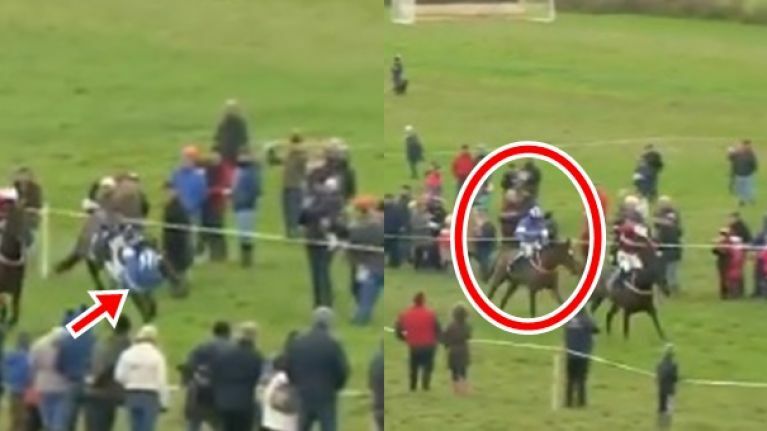 But the Boulta, Killeagh point to point track in County Cork was in for something heroic and the crowd were about to witness something special. From that man Sweeney. Declan Queally's horse bucked, lunged and leapt to get rid of him but he wasn't going away for anything and after having a tete a tete with his reins and with his horse's shoulder, the Waterford novice regained balance, composure and his seat like a pro. Some going Mikey. Small victories. He got back to work and his sprightly mare was agreeable. She kicked, drove and thundered up the home straight like she had moments previously. Surely she wasn't going to win from there though? On she went to overtake Colin Bowe's Forth-Worth Texas to take the race. Some going from horse and jockey. On a day when Rachael Blackmore got up after a horror fall aboard Cool Saint in Thurles to take her ride in the next race, it just goes to highlight the bravery, grit and courage of these riders.